I have always tried to do this by focusing on underexploited investment opportunities. In the 1970s that meant stock options. In the 1980s I had great success with managed futures. Also in the 1980s I had a family member who bet on football games. He knew I invested using quantitative methods, so he asked me to take a look at betting certain NFL home underdogs. I was skeptical and reluctant at first, but then obliged him. I was surprised to discover there was a profit there. I became intrigued with the possibility of exploiting inefficiencies in the football betting market. There were no sports databases back then and almost no published sports research. So I hired some UC Berkeley students to go through years of the data with me to test betting strategies. After we had a stable of successful angles, I put one of the students on a bus to Reno each weekend. Encouraged by our early results, I expanded my research to include college and pro football and basketball. We were incredibly successful with football. I focused on areas where the linesmakers were not paying enough attention, such as game time weather conditions, team mean reversion, public overconfidence, and over inflated betting lines. We even came up with a player stat-based Monte Carlo simulator that played through entire baseball games. It gave a good edge early in the season before others figured out the impact of off-season trades. One of my research assistants continued to analyze sports after graduation. He became Vice President of Basketball Operations for an NBA championship team, then VP of Basketball Strategy and Data Analysis with another NBA team. As we continued to do well, some bookmakers would no longer take our action. A smart one became friendly and brought us other bookmakers’ football lines. This way he would know our plays and could bet along with us. Afternoons we would hang large white marker boards on the walls of my investment office and write down the betting lines from all our sources. Fortunately, we had very few office visitors back then! As others found out about our success, I began managing a successful sports betting syndicate. I had a 12-foot BUD (Big Ugly Dish) installed at my house and would watch as many games as I could. That was the problem. Sports research and wagering took over my life. It was causing me to neglect my family. I also became concerned with security. As our wagering grew, we would fly to Las Vegas or receive FedEx packages full of cash in order to settle up. So I set sports aside. When I went to Nevada with friends, I never played casino games. When they asked why, I replied, “I don’t gamble.” They would laugh knowing I was betting tens of thousands of dollars every week on sporting events. But I have always needed a positive expectation before assuming any risk. To me, this is what distinguished what I was doing from gambling. 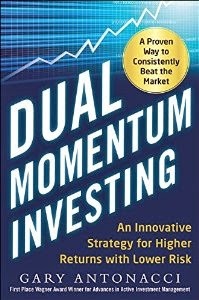 My need for a positive expectation also led me to the under exploited niche of dual momentum investing. Most of those who invest have little or no edge. You cannot have an advantage doing what everyone else is doing. You would be better off then investing in low-cost passive index funds. Herding is a powerful behavioral instinct that can lead to mediocre investment returns. You should have a healthy dose of skepticism about strategies that differ from the market portfolio. This also means looking beyond academic studies. You need to be aware of how strategies actually perform real time. And you need to consider how they will perform in the future as they attract more capital. . Dual momentum is generally ignored as an investment strategy. I don't expect that to change anytime soon due to strong behavioral biases. These include anchoring, aversion to tactical investing, home country bias, and familiarity biases. Betting lines, like financial markets, are mostly efficient. The only way to be confident you have an edge is through thorough research using plenty of data. Doing this gives you confidence. It helps you stay with your approach despite short-term fluctuations in the value of your bankroll or your investments. Dsciplined bankroll management is important for long-run success with sports and any other investment. The biggest problem with model development is expecting ex-post results to hold up well out-of-sample. Selection bias, over optimization, and model overfitting are also serious problems in both sports and non-sports research. If you keep tweaking your strategies, it isn’t difficult to find betting angles that give you over 60% winners. But these almost never hold up in real time. What you want is a logical basis for a wager, consistent back test results, and real-time validation of backtested strategies. Sports research taught me the importance of having simple strategies with intuitive logic behind them and plenty of backtest data. 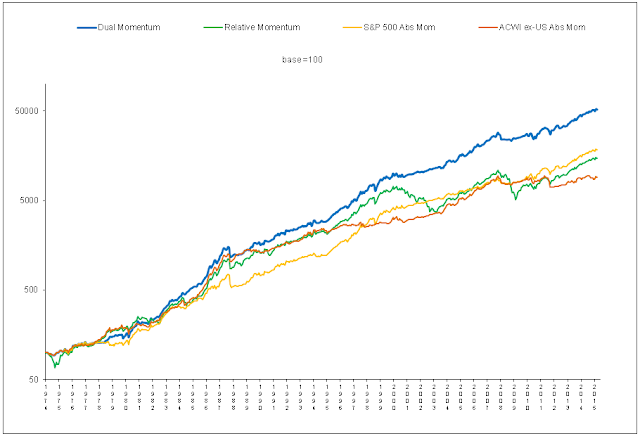 This is what led me to momentum investing. It is simple, logical, and supported by over 200 years of backtest validation across many different markets. If you win a profitable percentage of your sports bets, you are still going to have some serious losing streaks. You have to accept this. Warren Buffett is often quoted as saying the # 1 rule of investing is to not lose money, and the # 2 rule is to never forget rule #1. Yet Buffett’s Berkshire Hathaway was down more than 50% twice during the past 15 years. Despite this, Buffett has done well. Confidence in your approach and emotional discipline are what you need once you have a proven edge. Results are hypothetical, are NOT an indicator of future results, and do NOT represent returns that any investor actually attained. Indexes are unmanaged, do not reflect management or trading fees, and one cannot invest directly in an index. Please see our Disclaimer page for more information. Over one year or less, GEM didn't do much better than a coin flip. But over five or more years, results are considerably different. Patience is important whether you are a traditional investor or a speculator on sporting events. Warren Buffett was right when he said the stock market is a mechanism for transferring wealth from the impatient to the patient. You need to forget your likes or dislikes and go where the data takes you to be an effective sports bettor. The same is true with other types of investing. I have seen investors disregard good opportunities that conflicted with their prior beliefs and biases. To be a good winner over the long run, you need to be a good loser over the short run. You can do this if you have a proven edge, a simple approach, and realistic expectations. Good luck to you! Gary Antonacci has over 40 years’ experience as an investment professional focusing on underexploited investment opportunities. He is a popular speaker on momentum strategies, factor-based investing, and portfolio construction. After receiving his MBA degree from the Harvard Business School in 1978, Gary concentrated on researching and developing innovative investment strategies that have their basis in academic research. Gary introduced the world to dual momentum, which combines relative strength price momentum with trend following absolute momentum. This lead to his 2012 first place Wagner Award for Advances in Active Investment Management given annually by the National Association of Active Investment Managers (NAAIM).